Having lived in a small suburb of New York my whole life, I was eager to experience life somewhere else; I craved newness. Nearly all of my friends from home were born and raised in New York. At Dartmouth, students come from homes across the world. However, for a couple of incoming freshmen each year, home could be less than a 10-minute walk from campus. Dartmouth students who come from Hanover High School have a slightly atypical start to college, as it is not accompanied with an actual change in geographic location. Moreover, Hanover, with a population of around 11,500, is not exactly a metropolis. The nearest major city, Boston, is over two hours away. This geographic isolation leads to the phenomenon aptly referred to as the “Dartmouth bubble.” Dartmouth students can, at times, feel unconnected to the outside world, because our lives seem to revolve around our time on campus. Personally, I’ve gone weeks without having an in-person conversation with somebody who isn’t a Dartmouth student or faculty member. For Hanover natives, the proximity of home to college comes with advantages and disadvantages, all of which influence their Dartmouth experience. Due to the closeness of the Hanover community, many Dartmouth students from Hanover had the opportunity to take classes at Dartmouth prior to becoming a student. According to Hana Dai ’20, who has lived in Hanover for over 19 years, around 10 to 15 percent of Hanover High students take at least one Dartmouth class, which familiarizes them with the fast pace of Dartmouth courses while also providing them with a first impression of Dartmouth students. Ethan Adner ’22, who attended both middle and high school in Hanover, took PSYC 06, “Introduction to Neuroscience” during the winter of his senior year of high school. This course led Adner to an increased interest in neuroscience and showed him that many Dartmouth students have passions in STEM fields. Dai also took a Dartmouth course during her senior year of high school. Although Dai was nervous to start her first college class, her preconceived belief that “a professor would be scary and not willing to talk to students” was changed after she took her first class at Dartmouth. She realized that both students and professors are very approachable. Another student who has a lot of experience taking Dartmouth classes as a high school student is Busara Hall, a senior at Hartford High School in White River Junction, Vermont. Hall started taking classes at Dartmouth during his junior year of high school and had first impressions of the students in his classes that differed from his expectations. 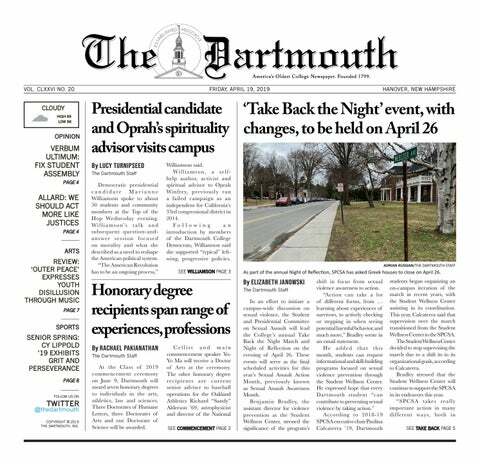 It is obvious that Dartmouth is closely tied to the Hanover community, and it is not uncommon to see Hanover natives walking around campus and taking advantage of the resources. Joe Zhang ’21 has fond memories of his time growing up here. Hanover High and Dartmouth students also share certain hangout spaces. For example, it is common for Hanover High students to study in Baker-Berry Library and eat at Boloco or Ramunto’s. However, not all of what Hanover and the Upper Valley have to offer is known to Dartmouth students. “Slowly, Dartmouth students are starting to find the local spots, but there are still hidden gems that people don’t really go out of their way to find,” Dai said. Despite the geographic similarities, Hanover High and Dartmouth College are two entirely different experiences. Dartmouth’s geographic isolation has influenced some of the College’s quirks and traditions. However, as Adner said, “College is more than just the location.” Hanover High students may know their way around campus better than most, but their transition to college is not necessarily any easier. We all come from different backgrounds, so no two Dartmouth experiences are the same — even those of students coming from the same high school in a very small town. The stories of Hanover-natives-turned-Dartmouth-students demonstrate that you don’t always have to travel far to gain new perspectives — sometimes, adventure awaits just outside your front door.